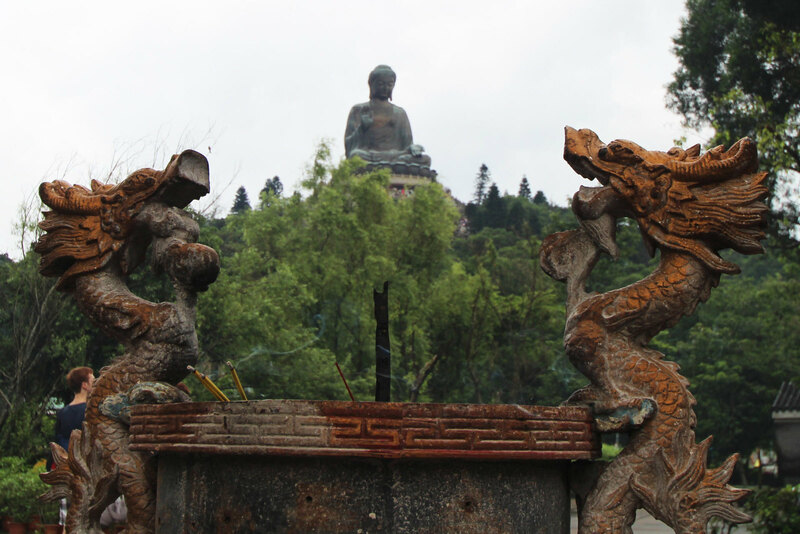 Hong Kong's Big Buddha is unmissable from almost anywhere in the city on a clear day. 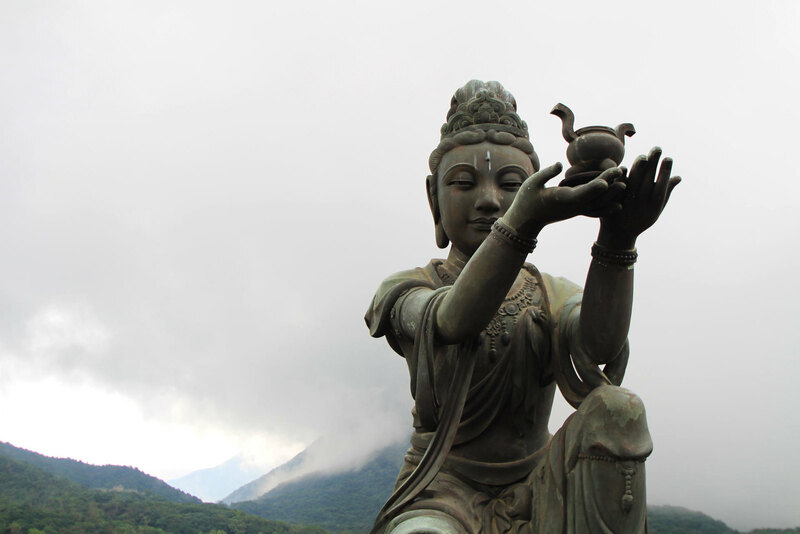 It's the first thing you'll see when you fly into Hong Kong airport, a sight I will remember for years to come - flying over the lush greenery and surrounding sky scrapers with the buddha sitting up in the midst of the clouds within the mountains, you can't deny how impressive it is. 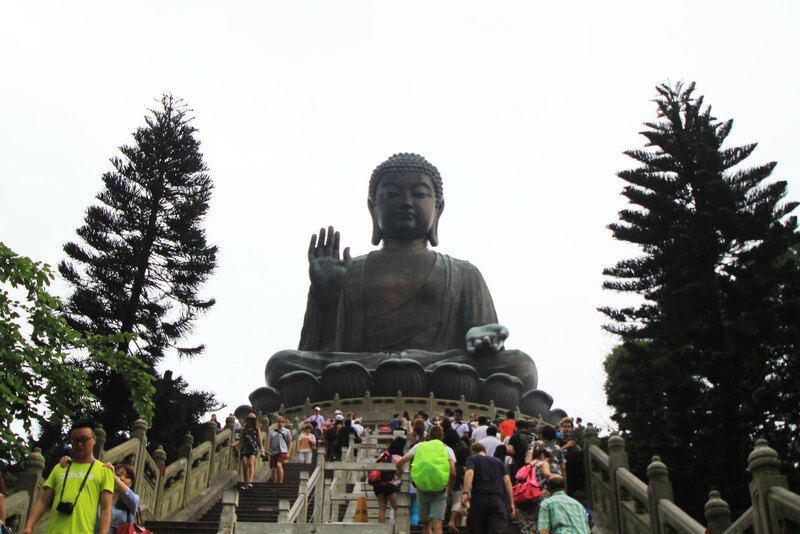 The photos I've shared here really don't stress the scale of this massive Buddha itself, sitting at 34 metres high and taking twelve years to complete. 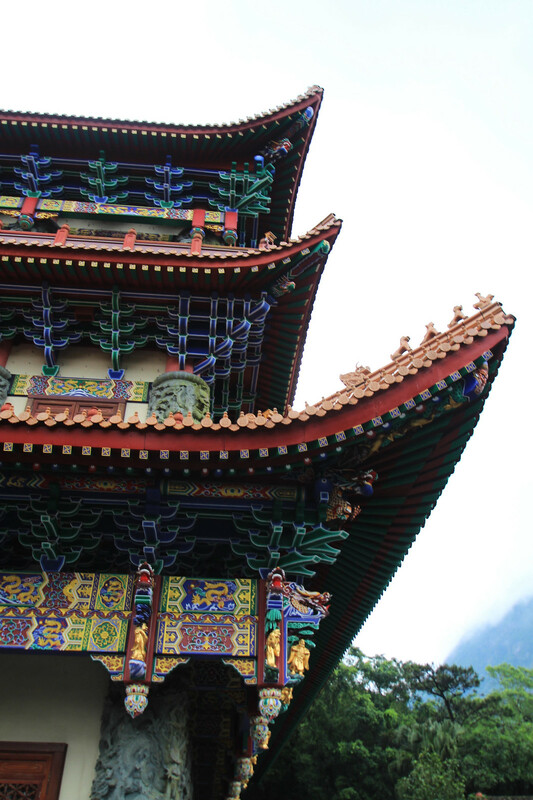 Although fairly recent in terms of Hong Kong's history, the Big Buddha was only built in 1993, which to date of 2016 makes it 23 years old. 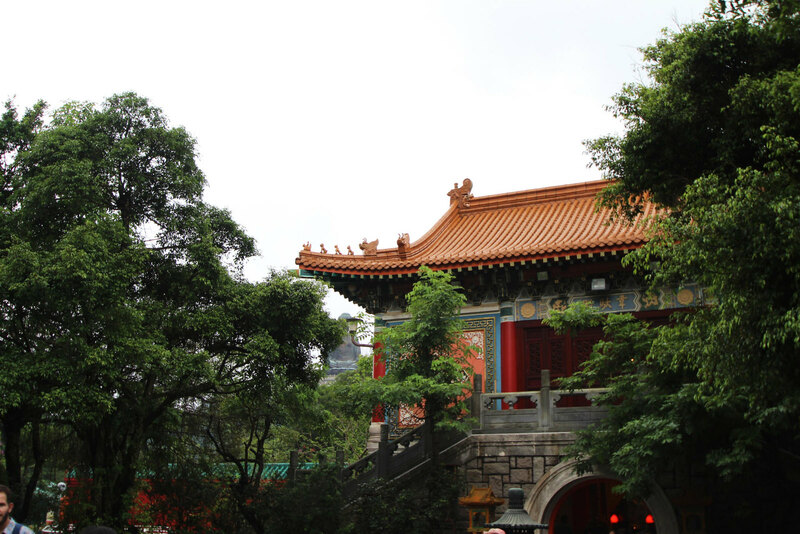 Bringing masses of tourism every year, to the otherwise once hidden remote Po Lin Monastery, previously deep into the lush mountains. 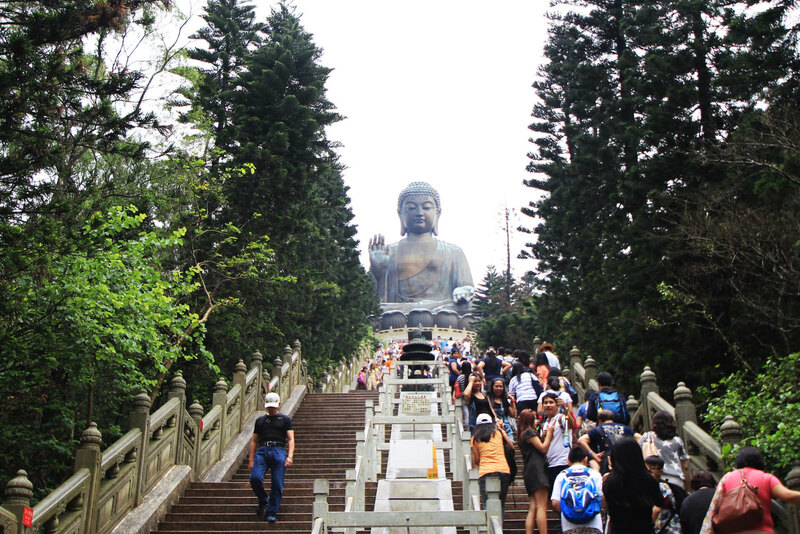 Take a climb up 268 steps to the top of the Buddha and take in the views across the mountains and down to the city skyscrapers below, which almost feel like a small dot when you're up so high. Just try not to focus too much on how high you actually are, especially if you're as scared of heights as I am! 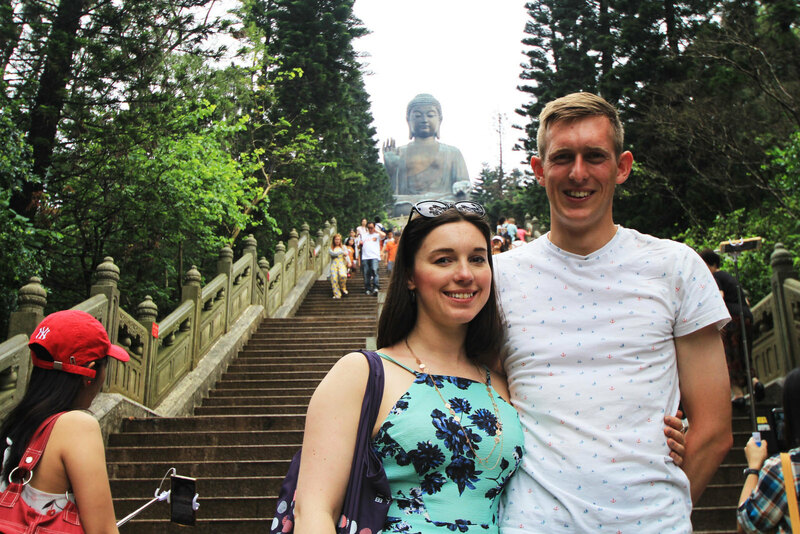 We took a ride on the worlds longest cable cars to reach the Buddha, and although a little expensive, the only other way up is a seven hour hike up the mountains, and somehow in the heat - we just didn't fancy it.. unsurprisingly. 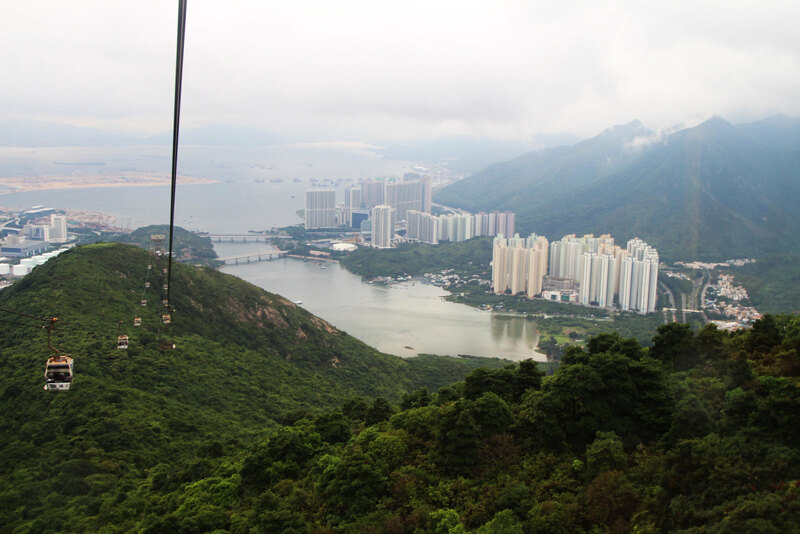 The cable cars are great, you get some fantastic views and if you're feeling super adventurous (and have a strong stomach) you can even get glass bottom cars to take you. Once you've reached the top, after around a 20-25 minute ride on the cable cars, you'll reach Ngong Ping village, a small touristy faux 'town' at the base of the Buddhas steps where you can buy various novelties and tourist treasures, and although it feels a little spoiled by the likes of Western food chains like Starbucks, you'll be thankful for the access to an ice cold drink when you're up there. 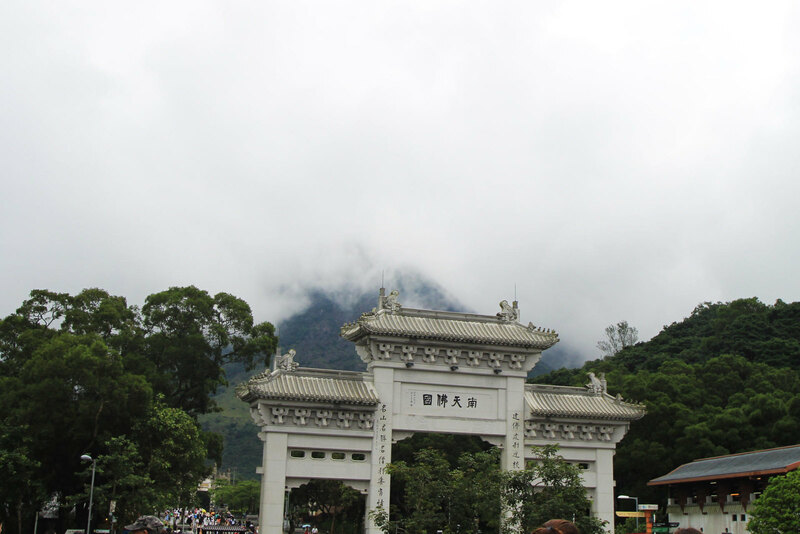 The weather can be hit and miss all over Hong Kong, but in the mountains especially. When we got on at the base of the mountain up to the Buddha there was gorgeous blue skies and it was relatively clear, but as we set off on our cable car the weather took a massive turn for the worst and we had some rather dramatic rain come crashing down and the fog swept in totally consuming the Buddha. After half an hour of looking through the shops and getting a drink, the weather lifted and we set back on our way to climb the steps up. You can pay a mere 30 HKD (£3) extra to enter an otherwise closed off exhibition within the Buddha itself once you reach the top, and it also entitles you to a meal ticket at the monasteries exclusively vegetarian restaurant, which for the price we got a great amount of food, and it even included drinks and a dessert. 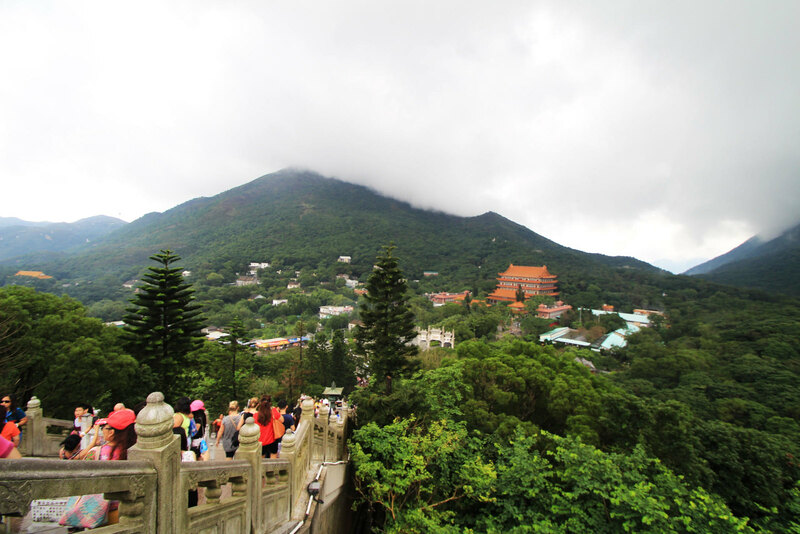 The restaurant to none ticket holders was equally as affordable and is a great place to get a snack whilst you're visiting the Buddha on Lantau Island. As Lantau Island is right by the airport, we were catching our hop over flight to Tokyo that evening, so decided to take a backpack each with us with our hand luggage only for the flight (which is around £60 return on Hong Kong Express, taking four hours) which we checked in at a luggage hold at the Buddha. This meant we were free to walk around and explore, and more importantly hike up the steps to the Buddha, without being held back from our luggage. It wasn't the cheapest to check our bags (£8) but for the day it was absolutely worth it when you're battling such extreme heat and humidity whilst hiking with a giant backpack on you, it's amazing what difference it makes! 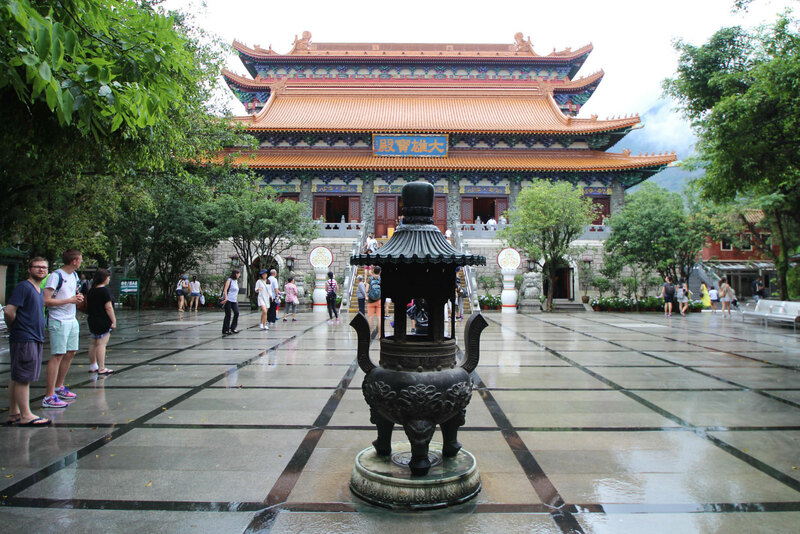 We had a great day exploring the Buddha and I wish the weather had been nicer so we could explore more of the surrounding village within the mountain, but we did all the main tourist 'sights' to see. 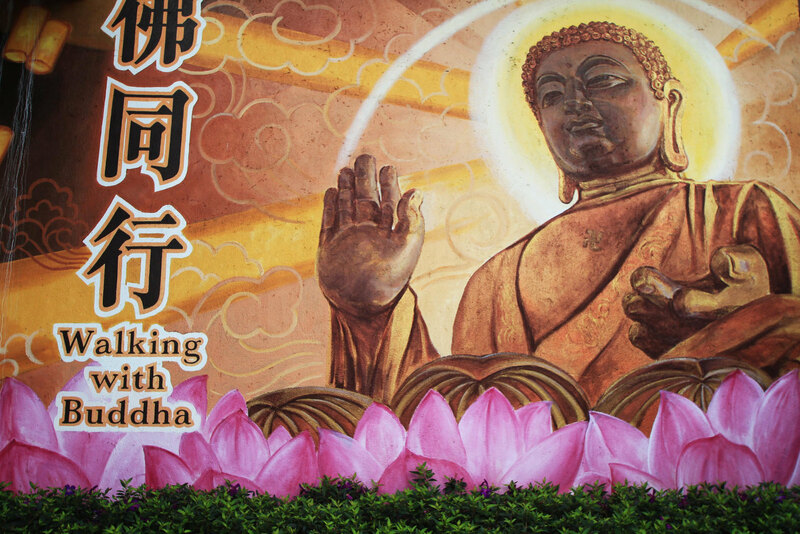 I would recommend leaving between 6-8 hours to see the Buddha including travel on the cable cars.